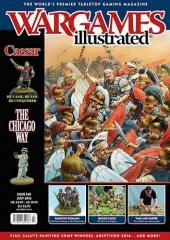 #345 "Painting Romans, Blood Eagle, War and Empire"
Veteran wargamer, rules writer and self-confessed Caesarian Simon MacDowall introduces us to this month’s theme - Wargaming with Julius Caesar. We take up our ‘Chicago Typewriters’ and try to bring law to the lawless during the Prohibition era of 1920s America. We continue our theme coverage with a look at Caesar’s finest hour, his defeat of Pompey the Great at the Battle of Pharsalus, 48BC. How was it possible to win such an uneven battle and how could this be emulated on the wargames table? YOU’VE SEEN THE TERRAIN, NOW WHAT’S THE GAME? A look at the idea behind the creation of our Salute 2016 participation game, the influences for figures and the rules. Every year the UK based Society of Ancients hold an annual ‘Battleday’, at which members and friends game the same battle using different rules over the course of one day and a dozen tables. We find out how this year’s Battleday played out. Nick Overland’s Modern era rules have been many years in creation and reflect a wealth of experience based upon many hours of gaming. Master brushman Ruben Torregrosa shows us how to paint some Forged in Battle Republican Romans. We take a trip to Adepticon and report back on the fantasy, the historical, the sci-fi and the Grand Melee games on offer. Simon Miller is a man comfortable with stepping into the sandals of Julius Caesar and emulating the great man on the tabletop, so he is well placed to offer some advice to other would be ‘miniature’ Roman generals. Following on from last month’s introduction to the period, David Bickley shares some ideas on gaming the early French Revolutionary Wars, with a particular focus on using Black Powder to do so. In company with this month’s theme, we try out these new Ancient-era rules designed by West Wind for large battles. We take a turn to the left here, with some insight into an alternate version of World War Two, complete with creatures from a bygone age. PROJECT SHOWCASE: DO YOU HAVE A CASTLE? Although intended for a particular game, this article looks at the creation of a castle that could grace many a battlefield. The Ministry of Gentlemanly Warfare discuss their latest offering, a Viking Age skirmish game which combines historical and mythological influences. Our annual round-up of the winning entries from this year’s Salute painting competition. Our roving reporter Paul Davies takes a trip to Legionary and shares some photos of the finest games from the show.